Today’s post has been provided by Karl Sharicz, CCXP, the Founder and Principal of CX Partners and ex-boardmember of the Customer Experience Professionals Association (CXPA). My finely attuned customer experience (CX) radar kicks in here and I notice that the word “customer” is missing. Not surprisingly though, upon reading the article, I see that executive pay is among the top concerns of CEOs. With that as my backdrop, I began reflecting upon my role as a CX professional over the past 14 years — not to mention my 37 years in direct customer-facing roles. After speaking with many of my counterparts across various industries, I’m continually perplexed by the struggle that we all seem to have driving the customer agenda to the center of importance within broader business strategy. It doesn’t help that the CEO position is often a revolving door. According to the HBR article mentioned above, in 2015, turnover among global CEOs reached a record rate of nearly 17% and more than one fifth were dismissed—reportedly for failing to resist the lure of short-termism. As CX professionals, we have all come to terms with the fact that CEO engagement and commitment in the form of demonstrated action is an essential requirement toward making CX a strategic imperative and competitive differentiator within any business. Given a 17% CEO turnover rate, it’s no wonder that, even in situations where the CEO was committed and actively involved in CX, a transition to a new CEO doesn’t come automatically loaded with a customer centric mindset. Therefore, whatever CX progress and success had been built up during that previous CEO’s tenure could in fact disappear rather quickly depending on the mindset of the incoming CEO. And so it goes that as a CX professional we all seem to struggle to varying degrees rolling that CX boulder up the hill. Considering what I have described, the challenges we face are partly out of our control. We can work diligently to advance the CX practice and build a solid business case for CX but then a change in leadership comes about and we are back at maybe square three or two (but hopefully never square one!). In some organizations that kind of transition can take CX entirely out of the strategic picture while in others it’s more a matter of restarting some parts of the CX journey all over again. That’s where the resiliency and determination of a CX professional is required — but only if the organization has the vision and the customer-centric mindset and is not swayed by another round of short-termism. CX is not easy and CX is a long-term strategy. Those in CX roles know all too well, just as I have experienced, that after five, seven or even ten years into the journey, and with many hurdles overcome and many accomplishments to show, we can still feel as if we are just at the beginning of the CX transformation. 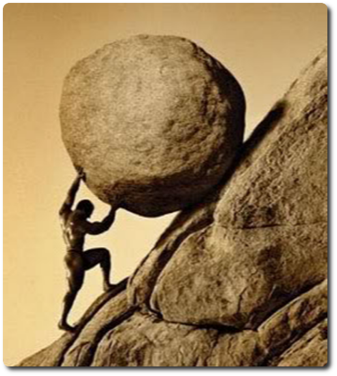 We continually push that boulder while simultaneously attempting to alter the landscape so that the push becomes just a nudge as we strive for the day that the boulder starts rolling with its own momentum while we guide it along the success path. Progress may be slower than we’d like it to be, but I feel the secret lies within our ability to educate and influence key stakeholders within the business. And if we find ourselves at an impasse due to factors beyond our control, then to recognize that and recognize that it’s time to move on. Look within your own organization to see where the commitment to CX is strongest and leverage that energy to your advantage. The bottom line however is that without a committed leadership team, the grade will be uphill and steep and the boulder will move very slowly, if at all. Just watch that it doesn’t start rolling back in your direction.